With just a simple scan, this pocket-sized tool will help you understand what products your body wants. 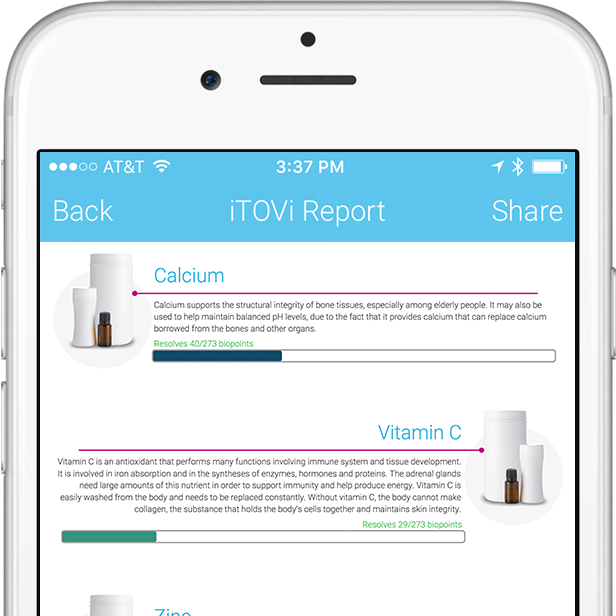 Using proven scientific technology and a patented algorithm, iTOVi takes the guesswork out of the growing world of essential oils and supplements. So whether you’re wanting to listen to your own body or help others understand their needs, the iTOVi scanner is the perfect companion. 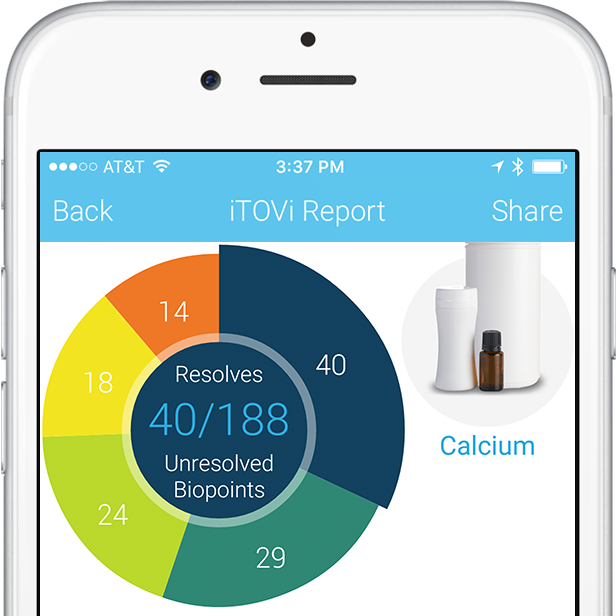 The iTOVi scanner is the only wellness tool currently interpreting over 270 biopoints across the body. This extensive body composition analysis allows the iTOVi scanner to understand your body’s data more completely. The iTOVi is not a Medical Device. It does not identify, diagnose or indicate how to treat any disease or medical condition. The device measures Galvanic Skin Response (GSR). GSR is an established technology that measures fluctuation in electrical conductivity of the skin. One familiar application of GSR is lie-detector testing. During an iTOVi session the tracker sends electrical frequencies to your body. The products you are being scanned for have frequencies in them. The tracker measures your body’s responses to those frequencies. This process is called bio-impedance. Bio-impedance is used in everything from fitness trackers to medical devices, and is widely researched and proven. iTOVi runs the data collected from your responses through a variety of complex equations and algorithms. 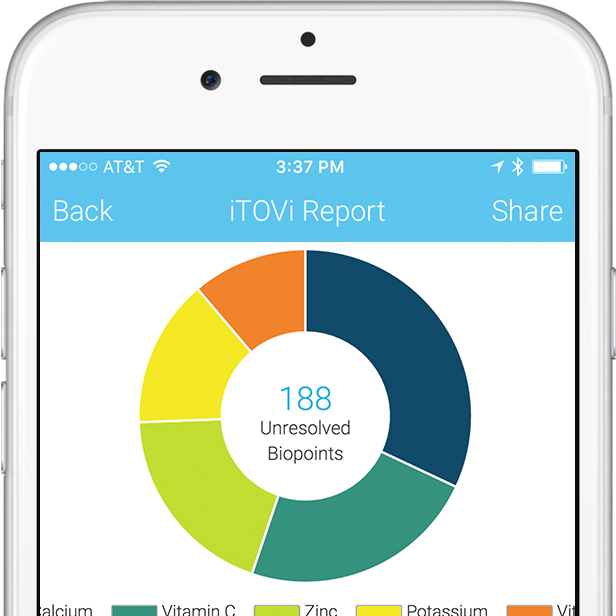 When the scan is complete, iTOVi provides an individual with a simple personalized nutrition report of suggested products to begin taking, or keep taking. The products suggested are prioritized, according to one’s responses (or reactions) to the frequencies. The report is available to assist individuals as they choose options to maintain health & wellness. Remembering that good nutrition is foundational, the suggestions allow a person to select the products they feel will benefit them. The numeric value produced indicates how divergent the biopoint response is from the baseline. In other words, suggestions are indicated to help bring the body into better balance. ​A client’s current emotion can influence the iTOVi score as well, so take that into consideration. While the results are not diagnostic, they will narrow down the essential supplement choices a person’s body will most benefit from using. This testing generally takes less than 1 minute and anyone can use this technology, including those with pace-makers, women who are pregnant, children, and even infants. Selecting any number on the iTOVi scoring circle will show you what number, out of your overall unresolved score, each recommended product will help to resolve. This score is a breakdown of your unresolved biopoints. The first number indicates how many biopoints, out of your total unresolved, the product suggested will remedy. The second number indicates your total unresolved biopoints, out of the 270+ biopoints scanned. ​Tapping on a product’s picture will give a complete summary of that product, including what it’s used for and its benefits. The iTOVi scanner is designed to offer individualized results; product recommendations are always specific to the person being scanned.